The Women’s March this past Saturday left many of us shocked, angered, and saddened at the actions and speech of those who claim to stand for human rights. Regardless of the individual issues women may have been marching for, they were lost in the sea of pro-abortion rhetoric and drowned out by the shock and awe factor of many protestors and celebrities. In the aftermath ladies took to social media to say how appalled they were, hoping to distance themselves from the marchers. Many, including myself, felt misrepresented by those who say they have women’s interests at heart. But sadly, they do represent our culture. When a society removes God from its schools and public square, the god of self rises up in place. It’s then just a straight line to the disregard for the sanctity of life that was created in His image. Proverbs 8:36 says, “All those who hate Me love death”. When self becomes a god, a disdain for children, and mothering in general, naturally follows. The reigning ideology today insists that a mother determines whether or not she wants to be one, and whether or not she perceives a child worthy of life, even as it develops in her womb. In the last 50 years, the feminist movement has done a very good job of persuading women that they should be ashamed and even fearful of traditional women’s roles. Motherhood is not celebrated or embraced in our post-modern society; it is reviled. This attitude has not only infected our culture, but sadly, the Church as well. We may not be protesting in the streets wearing vulgar crocheted hats and carrying posters ladened with obscenity, but we protest quietly in our homes and churches against motherhood the way God designed it. 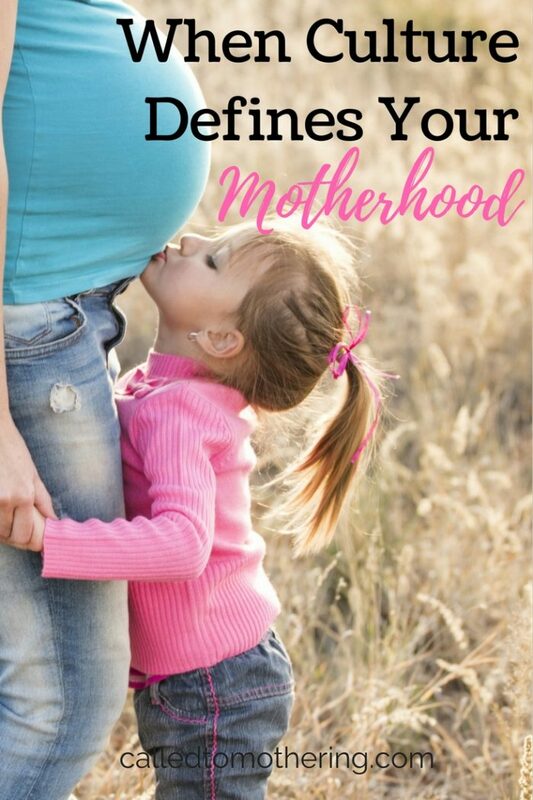 Deep down we don’t truly revere motherhood as the noble and worthy calling it is. When someone asks us what we do we usually respond with, “I’m just a mom”, almost apologetically. 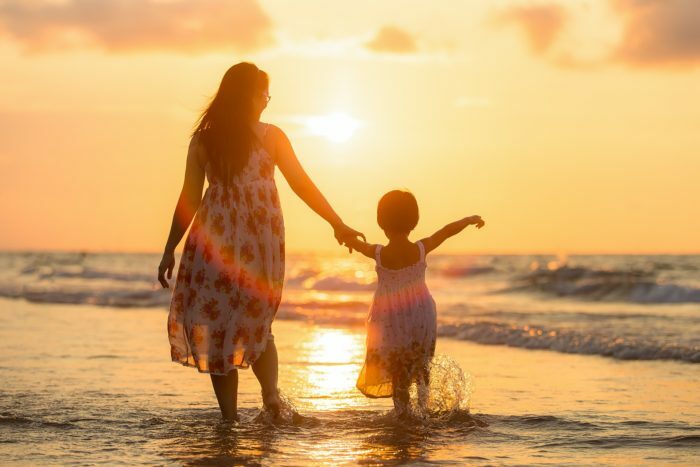 The kind of “woe-is-me” mothering that undermines the joy found in motherhood is peppered in our chats during playdates and fellowship times. I hear it from the mouths of mothers every day in stores, parks, moms’ groups and yes, even from my own. That irritated, begrudging tone which conveys to a child that they are an interruption and your (fill in the blank) is more important than they are. We eagerly count down the minutes until bedtime and the days until our kids go back to school. Children are usually seen more as a nuisance than as a blessing. Psalm 127:3-5, which says they’re a gift, seems like an outdated verse from a more primitive time. We put our careers ahead of our children, and wait as long as possible after getting married to have them. When women are newlyweds, we caution them not to get pregnant too soon. We treat our fertility as a disease, taking pills to prevent it. Then we turn it on and off like a faucet until our biological clock stops ticking. It is completely normal for us to be separated from our children for the majority of our waking hours because we send them to school. Homeschooling is still not the norm among Christians because we’re convinced someone else will do a better job at teaching our kids. Our evangelical churches even so nicely help us out on Sunday mornings by filling nurseries and children’s classrooms so we (and everybody else) won’t be bothered during the service. We’ve let cultural expectations dictate what we call normal, instead of the Bible. And Satan just loves that. He has a special hatred for women, because they are life givers. Mothering represents laying down your life for another, which represents the Gospel. Any aversion to self-sacrifice will serve his purposes beautifully. I’ll make a confession: as a mother, I don’t really consider it all joy to serve my kids. I’m not particularly fond of the “used up” part of servanthood that mothering often requires of me. We can’t forget that the enemy’s kingdom is a kingdom of death, which the world embraces and reflects. Satan will do anything he can to prevent new life from being born, both physically and spiritually. He hates when you teach your kids about God and His Word. So he makes motherhood something to be tolerated, instead of savored. Something to “get through”, instead of a purposeful mission. He knows that, if we’ve raised them biblically, they will be launched from our home as arrows aimed directly at the kingdom of darkness. He knows you play the most important role of anyone. Resist taking on the opinions of a culture who rejects God and squandering your motherhood. Children are given to us as gifts, as tools, as a heritage, as a growing of His church, and as a means by which we are changed, challenged and formed more into the Lord’s image! We need to put God back into schools! This is a great blog. Being a Mother is raising the future leaders of our country. I can’t think if anything more important than that. Teaching them God’s word and about His love is preparing them to have a close relationship with God. Which is the most important job you will ever have. Thanks for your encouragement and comment, Tammy. It doesn’t feel like it at times, that this is the most important job in the world, but then again that’s exactly what the enemy wants us to think! Congratulations Abbey, that’s so exciting! It’s awesome to be a representative of God’s love in this way as a mom. He knows that, if we’ve raised them biblically, they will be launched from our home as arrows aimed directly at the kingdom of darkness. <Yes! I totally agree with this statement. I think that often we can forget not only that motherhood is a blessing, but that it is a blessing that is so precious and special on God's eyes! Thank you for this! Thanks Patty! I wish the church as a whole understood that children are “like arrows in the hand of a warrior.” The enemy loves to conceal this truth. I struggled with this big time also, as a new mom. It was ingrained in me to get my degree and work for several years before having children, and I really found my identity in that. When my son was born 8 years ago, I knew I wanted to stay home with him, but I was convinced someone- anybody- else would be better at parenting him than me. I didn’t know my value as a mother! There were so many good nuggets in this post! I loved the connection you made between culture, abortion, and Proverbs 8:36. And I’m glad you bolded this line cause it’s powerful- “He knows that, if we’ve raised them biblically, they will be launched from our home as arrows aimed directly at the kingdom of darkness. He knows you play the most important role of anyone.” I’ll be sharing that line with my instagram! ( I will say though, that I encourage new wives to wait a few years after marriage to have kids because I believe it’s wise to figure out your bond with your husband before adding children to the mix…) Great stance, love the no-nonsense attitude! Thank you for sharing that statement with your readers, Liz! I myself waited five years after getting married to have kids and would warn young wives to “enjoy their freedom” while they could. I think it’s more about how we tell them to wait- do we encourage and bless, or do we convey that motherhood steals from their marriage? This is an incredible post!!! I had both tears and chills as you preached truth through it all! THANK YOU for your voice and your beautiful blog!! I’m a new follower and I’m LOVING what you write. I’m also a new stay-at-home mom of a six-month-old, a Catholic who uses natural family planning instead of birth control in order to be more open to God’s plan for our family, and a former crisis pregnancy center nurse. So much of what you wrote in this post is resonating in my heart and soul. THIS is exactly what I have been feeling when women defend the reasons they marched…I understand not all of them marched for abortion rights but the reality is that Planned Parenthood and such USED them and their numbers to make it look like they were all pro-abortion as you said. Again, this was just excellent. Refreshing, convicting, and encouraging. Thank you for this. I’m a mother of three (ages 5, 4 and almost 3) with a fourth due in a few months and let me tell you, this pregnancy has been hard. I miscarried last year at 18 weeks and my body just can’t handle it the same. God has moved one mountain after another this pregnancy but it has still been hard! I’ve had to take it easy and have had nothing but external opinions of how awful it is that I don’t have my kids in sports, that we aren’t participating in a co-op and that I don’t get out much anymore. I’ve let this change my opinion of me and steal my joy from being a mom. I mean sheesh even typing that I can clearly see that my plate is full! But I’ve let myself become blinded by this distaste for motherhood. And I am more than guilty of complaining about the “inconvenience” of mothering and missing the me time (okay whining about me time) and it always becomes a mom whining contest when our friends get together. This post was one ping in the pit of my stomach after another. Thank you for waking this girl up!! Great post! If I had to do it all over again, I would have kept my son at home and homeschooled. I am blessed that God gave me a child who can think for himself and not fall into the world’s norm. I attend a church that many moms homeschool and the church recently started a day school. We love children at Believers and are training the next generation for Christ. May this nation turn back to God and quickly. Blessings to you and yours! Thanks for reading and commenting, Elaine. God has revealed the many blessings of homeschooling to me over the past few years, even though I was extremely reluctant to start in the beginning. That’s great that your church is supporting parents in raising up the next generation of believers! They will be instrumental in turning America back to the Lord. Such a great article and challenging reminder for me as a mom. I need to take more joy in my important role as a mother that stays home with her little ones all day! Can’t say “Amen!” enough to this post. As a new SAHM I’ve experienced so many of these sentiments. Thank you! A wonderful, thoughtful post. I’ll be sharing this on my Pinterest! Thank you for writing this. I’ve distanced myself from other moms who do not think like this because it eats me up inside if I went on all those playdates etc. It does mean that I am often alone and time by time I feel really lonely. My husband works a lot, I have no family here and my 3yr old son is talking a lot, but its not the same as grown-up-talk. I’m so glad that our heavenly Father is always with me and understands me. I’m also very glad that He showed me blog of yours which encourages me and understands me.